Illness, work, and family meant taking a wee bit of time off the beer quest. But I was back on it with a bang this weekend, and what a beer to get back on the wagon with. Description: Poured a deep black tar like colour with a chocolate head that soon disappeared. 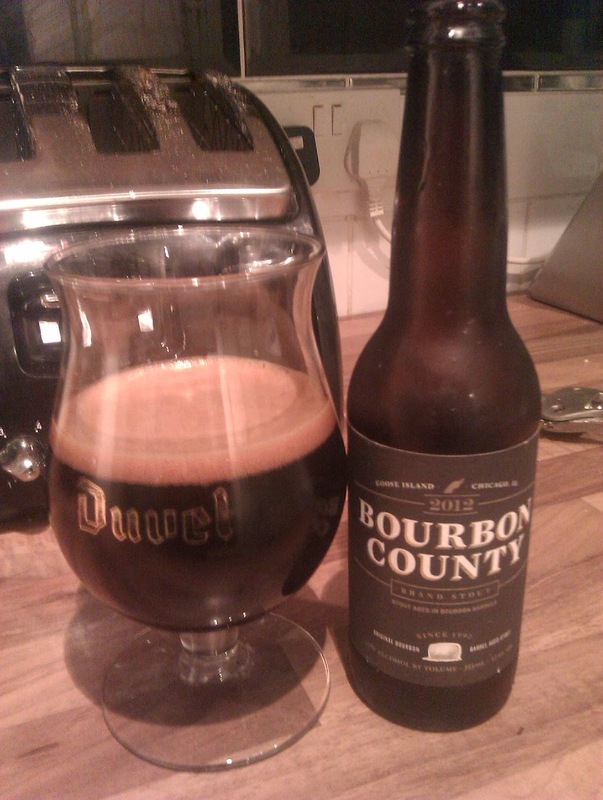 Wow - lots going on aroma wise, big boozy bourbon hit, dark chocolate, some vanilla, and some woody notes. The flavours back that up, dark chocolate, burnt malts, a little lightness from some vanilla and ripe fruits – but the main flavour is oak and bourbon booze. As it warmed up it got more complex flavour wise, with the booze moving slightly more into the background (just slightly though!). Big mouth feel, full bodie, sticky but weirdly still smooth at the same time. Long boozy finish. Thoughts: Delighted the guys at the Lighthouse got this in; its one of those beers geeks like me just want to get their hands on. Worth every penny, this is a lovely complex beer. I had the 2012 vintage, and it was still very boozy – I have another bottle I'm going to keep for awhile and really believe this beer will improve with age. Can't wait to try the aged bottle! Description: Straw yellow and clear. Good white head. Lager aroma, with a wee bit of fruit. Light, fizzy, some hops, and some bitterness on the finish. 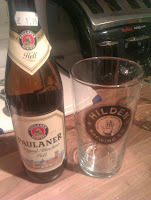 Thoughts: This was grand, not as good as the other Helles I've had recently but drinkable, if unremarkable, German fare. Description: Light yellow and hazy, big white head, and plenty of visible bubbles. That great wheat beer smell, lots of banana, spice, and little hop background. Again lots of banana in the taste, a little spice, wheat and something a little floral in the background. Light and fizzy. 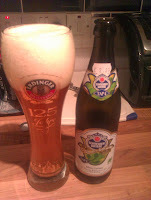 Thoughts: I enjoyed this, a real banana bomb of a wheat beer, not as good as their Mein Hopfeweisse, but very drinkable. Hoping to get a trip out into Belfast this weekend and a tour of a few new bars. Also hoping to make it to Beer Club Belfast on the 17th October, you should try and get there too if you can make it! If you're around Belfast on Saturday, I'm meeting Steve from Beers I've Known and a few of the local CAMRA guys to try out the Wetherspoon festival beers at The Bridge House, from around 2pm. It would be great to meet you. Sounds good, domestic life might prevent me getting there (I'm waiting for a cooker to be delivered and installed during the day) but if all gets sorted out I'll pop down for awhile. Would be good to meet up!